People are vague. You are vague. I am vague. We say things without digging into the details; we often use the first word that comes to mind. This makes sense — otherwise, we’d spend all our time clarifying. When someone give an excuse like “It takes too much time,” what’s the excuse behind the excuse, and how can we address that? When someone gives a compliment like “Thank you for sharing an inspiring post,” what kind of inspiring was it, and how can I get better at that? Let me start with the example of inspiration, because it’s something I want to translate into concrete feedback and action. I thought about the different responses I have to things that inspire me. Alternatives: Inspiration can help me see different ways of doing something. 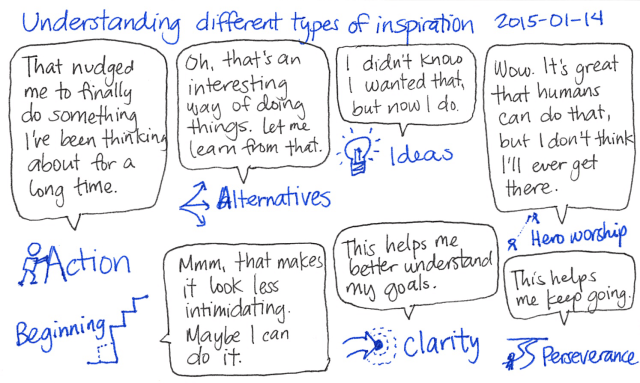 For example, I looked at ways other people coloured their sketchnotes and picked several techniques to try. Beginning: Inspiration can show me that something is less intimidating than I thought it was. It can help me figure out a good place to start and give me the courage to do it. Programming tutorials help me get through the initial challenges of a new framework. Action: Inspiration can move me to act on something. I already know it’s a good idea and I’ve been meaning to do it, but sometimes I need that extra push. Comments with questions and suggestions help me a lot. Perseverance: Sometimes I can feel lost or discouraged. Remembering that other people have dealt with bigger challenges helps me address my anxiety, focus on my goals or my progress, and keep going. Anecdotes are easy to find. Hero worship: I often come across stuff that looks so awesome, I don’t think I could ever do anything like it. This is the type of “inspiration” we tend to get bombarded with. This is the least useful kind of inspiration, I think. It takes a little work to transform it into the kind of inspiration I can use: I need to reflect on what part of it resonates with and how I can incorporate a little of that into my life. In what ways do I want to inspire others? How can I get better at that? I like inspiring with ideas, playing with what’s possible. I can get better at that by sharing more of these little tweaks. I think out loud in order to help people with clarity. I sketch out the reasons and consequences of my choices so that other people can learn without necessarily having to make all those choices themselves. I explore and summarize alternatives so that people can use that to figure out what might fit them. I can get better at that by researching what other people have done, generating a few new ideas (possibly by combining other ideas), and testing things out so that I can share my experiences. I break things down to help people with beginning. This is why I like addressing the “Yeah, but…”s, the excuses, the things that get in people’s way. This is also why I like sharing ideas, because that can help pull people forward. I’d love to get better at moving people to action. I haven’t given this as much thought yet, but I think it’s the most important. I don’t have much to share in terms of perseverance. I’ve been very lucky. I definitely don’t want to be in the region of hero worship. It creates too much distance and can shut down action. Breaking a general statement down into more specific statements helps me learn a lot. I ask myself: “What would I or someone say that captures a different aspect of this?” and I write that down. When I split off different aspects, I can understand those aspects better, and I can understand the whole thing better too. This technique is good to use for excuses, too. I’m getting better at catching myself when I give an excuse, drilling down with “Why?” and splitting it out into different excuses. (I guess, thanks to my parents’ patience, my inner toddler never stopped asking questions.) Then I can check if those excuses match what’s getting in my way, or if they don’t resonate with me. “Too much time” is too vague to address. 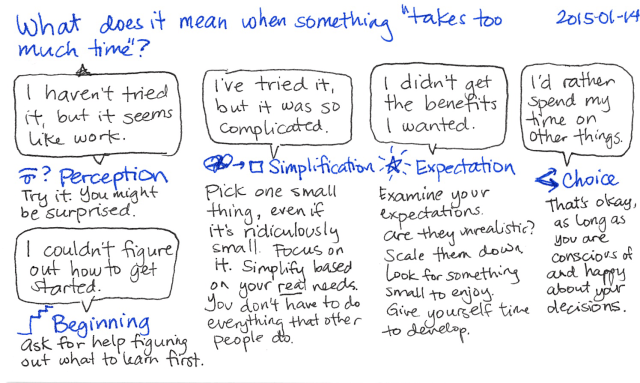 On the other hand, if you think something takes too much time because you’re trying to do something complicated, you might be able to ask yourself: “What do I really need? Can I get away with doing something simpler?” and then reduce the task to something small enough for you to get started with. Break things down. Find the statement behind the statement or the excuse behind the excuse, and you’ll have more to work with. Instead of getting frustrated because you can’t come up with one specific answer, come up with lots of them, and then see if you recognize yourself in any of them. Almost there, but not quite? Come up with more answers, maybe combining aspects of the ones you already have. This will not only help you understand yourself, but also understand others–and help others understand themselves and you. If you find my posts inspiring, would you consider helping me understand more about what kind of inspiration you get and how I can get better at it? 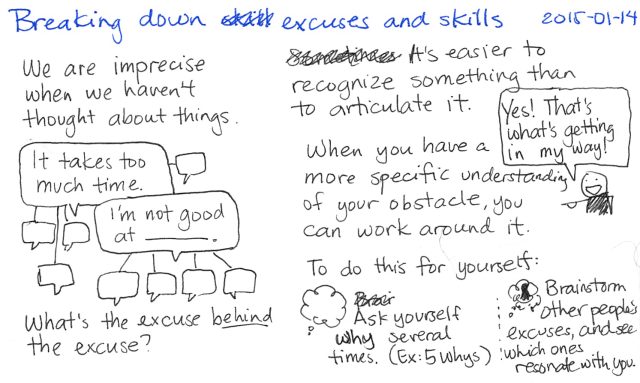 If you’re reading this because you recognize one of your excuses in it, would you mind figuring out what your more specific reasons are and what could address them? I’d love to hear from you in the comments below. Thanks!